During the currently heated race to build self-driving cars, Toyota is taking a different approach and looking into another vehicular upgrade: flying. As shown in the figure above, the car comprises a unique, stackable wing system that could potentially serve as the flying mechanism for a car. 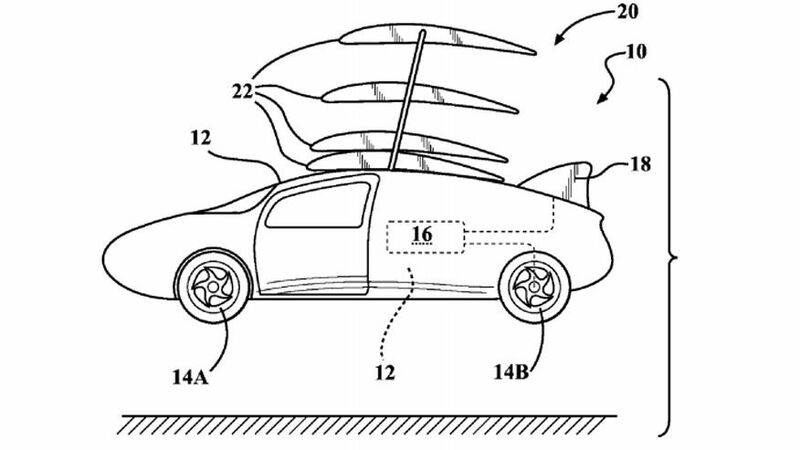 Rather than relying on heavy folding wings that compromises width and visibility of the vehicle when in driving mode, Toyota’s idea is based on making several narrow wings on the roof the car. The exemplary four-wing design also has a morphing bottom section that allows the wings to be more closely stacked when not in use. Further, the patent suggests that all four wings would be used during takeoff, while as little as two could keep the vehicle aloft at cruising speed. Toyota stated that “these patents represent the brainpower, innovation, diligence and passion of Toyota’s Engineers and Researchers,” suggesting that this idea is only the beginning of what Toyota has in mind for flying cars and the like.